Eleven riders set out for Tissington, including Joe Klay and new rider, Rachel. We rode out along Buxton Road before turning off for Thorncliffe and Warslow. We dropped down in to Hulme End and headed to Alstonfield before reaching the main Ashbourne Road and headed in to Tissington. As we had only ridden sixteen miles, it was decided to head for Carsington and so we rode past the ford and in to Bradbourne before turning towards Carsington and here we pulled in to The Pudding Room. Aide H turned off before to head back via a different route but nice to see him out. There was a large group of cyclists just leaving and so we took their places and enjoyed Coffee and other delights. There was much talk of trying new routes and cafes which should prove interesting and I hope it leads to discovering new roads. 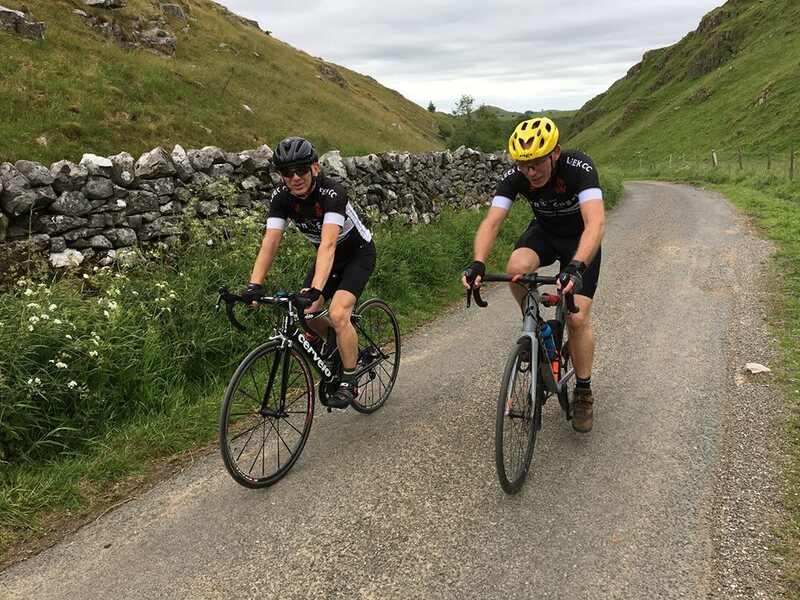 We headed back by tackling Brassington Bank and I am afraid that having been well and truly dropped last week, I decided it was time for me to drop riders so took off, sorry about that! We re-grouped and rode in to Longcliffe and on to Elton before reaching Parsley Hay where a argument between a walker and classic car owner provided much amusement, no doubt they are still there. We rode along part of the Erocia event course and so passed a few riders on classic bikes which was nice to see. We dropped in to Glutten Bridge and here I must apologise for almost leaving Rich C behind. Mr kippling has a lot to answer for, now can I take this hair shirt off? We took on the long climb up to Flash, past the race track and again, I could not resist leading the climb. We re-grouped and rode in to Flash where a deep pot hole caused a loud crack from Rich C’s bike, hope all is well with it. The group continued around the back of the Roaches where tired legs were on show but the long down hill in to Meerbrook provided a rest before the final climb to Abbey Green where we arrived back in Leek at ten past two, after a tough fifty eight mile ride. Thanks to Paul H and Phil G for leading the ride and for pointing out the collection of Trabants during the ride.